“for his work on the elementary charge of electricity and on the photoelectric effect”. “He who has seen that experiment, and hundreds of investigators have observed it, has literally seen the electron”. Quite often we physicists say that we see those things on which we are working, no matter how small, or even abstract they may be. There is little doubt, however, that inside the apparatus used by Millikan there was a world of particles with which he became so familiar that he unblushingly claimed to see things in that world. Robert Andrews Millikan (1868-1953). Credits: Wikipedia. 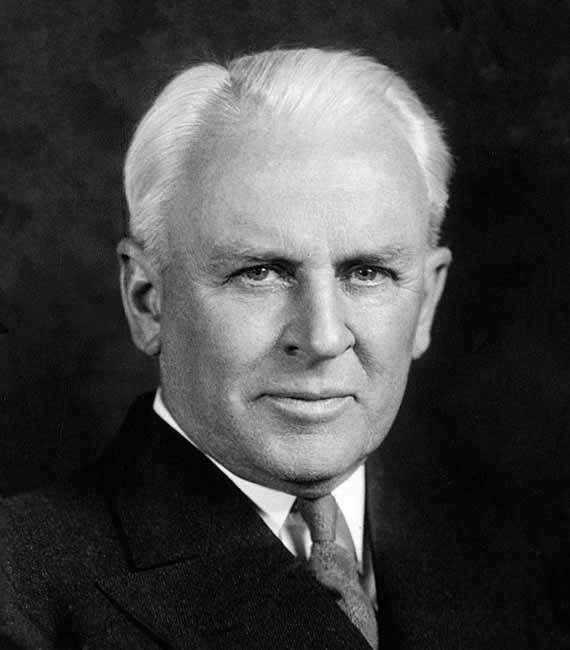 Robert Andrews Millikan was born in Morrison, Illinois (USA) on March 22, 1868. After graduating from Oberlin College in Ohio (1891) -where he particularly enjoyed studying Greek and mathematics- he did two courses in elementary physics, which awakened his interest in this discipline. In 1893 he was awarded a fellowship at Columbia University, from which he received his PhD in 1895 for a thesis on the polarization of light emitted by incandescent surfaces. A phenomenon that had originally been observed (1824) by François Aragó, Millikan used molten gold and silver from the US Department of Treasury to prove his thesis. After spending a year (1896) in Germany at the Universities of Berlin and Götingen, he return to the United States to take up an invitation from the physicist and fellow Nobel Laureate Albert A. Michelson to become his assistant in the recently founded Ryerson Laboratory at the University of Chicago. He was eventually to become a lecturer there (1910), a post he held until 1921. 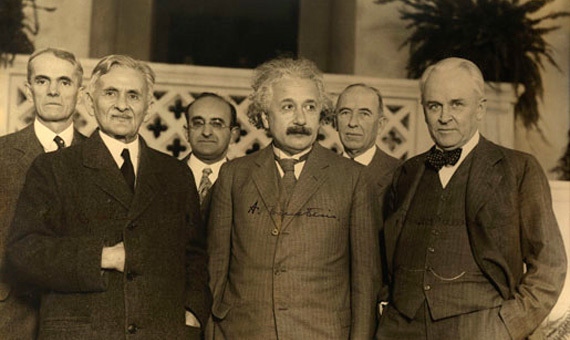 In the course of his life (he died in 1953) Millikan was a Professor of Physics, Director of the Norman Bridge Physics Laboratory and President of the California Institute of Technology (CALTECH). Millikan was a key figure in the development of physics in the United States in the first half of the 20th century. If required to classify him as a physicist, his facet as an experimental physicist would undoubtedly have to be highlighted, as would the numerous important discoveries he made, predominantly in the fields of optics and molecular physics. Millikan’s first great achievement was to determine the charge of the electron, to which end he used the “oil-drop method”. J. J. Thomson, the British physicist, had already established the charge-to-mass ratio of the electron back in 1897, but neither of them separately. Accordingly, if it was possible to determine one of these values separately (charge or mass), the other could be easily calculated. Millikan, with the aid of Harvey Fletcher, one of his doctoral students, used the oil-drop experiment to measure the charge of the electron (and with this, its mass). When Millikan began a long series of experiments in 1907, he had already been working at the University of Chicago for ten years, had got married, was the father of three children and about to celebrate his fortieth birthday. He had earned great renown as a physics lecturer, but had still not achieved anything noteworthy as a scientific investigator. The fundamental electric charge is one of the basic constants in physics, consequently, its accurate determination is essential for this discipline. In his experiment, Millikan measures the electrical force on a small oil-drop that has been charged by an electrical field created between two electrodes when the drop was in the gravitational field. As the electrical field was known, it was possible to determine the accumulated charge on the oil-drop. Diagram of the apparatus used by Millikan to measure the charge of the electron. Credits: A. Beléndez. A spray formed oil-drops, some of which fell through a small gap into a uniform, electrical field area space by two parallel, charged plates. 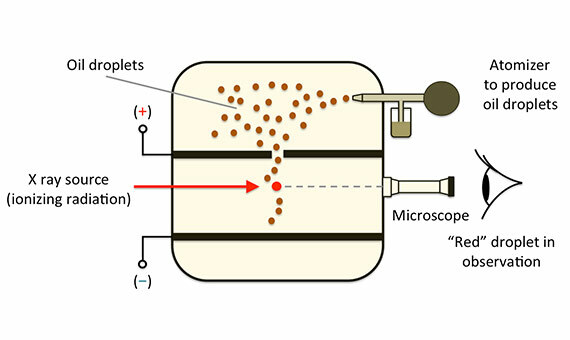 A microscope made it possible to observe a particular oil-drop and learn its mass by measuring the terminal speed of its fall. The oil-drop was charged with x-rays, and by adjusting the electrical field, it was possible to get it to remain in repose, in static equilibrium, when the electrical force was equal to the opposing gravitational force. Millikan, carrying out a long and tedious task that involved a set of collateral experiments, repeated the experiment numerous times, eventually concluding that the results obtained could be explained if there was a single, elementary charge (the value of which he determined) and the charges identified were integer multiples of this number. In 1909 he sent his first article for publication, in which he explained a technique he called “a drop equilibrium method to determine the charge of the electron, e”, entitled “A new modification of the cloud method of determining the elementary electrical charge and the most probable value of that charge” . Millikan included his personal opinions on the reliability and validity of each one of his 38 observations. He marked seven “very good” observations with two asterisks, ten “good” ones with a single asterisk and left the remaining thirteen “satisfactory” ones unmarked. A genuine act of honesty, with respect to which the science historian Gerald Holton would later refer to as “a rather uncommon gesture in scientific publications”. In September 1910, Millikan published a second article in the journal Science about the charge of electrons entitled, “The isolation of an ion, a precision measurement of its charge, and the correction of Stokes’s law” , the first ever to fully explain his “drop equilibrium” method. Three years later, in 1913 Millikan improved the results obtained to determine the charge of the electron e = 4.774 ± 0.009 x 10-10 electrostatic units of charge (esu), i.e. 1.592 x 10-19 C (1 esu = 3.33564×10-10 C) which is slightly below the currently accepted value of 1.602 x 10-19 C, most likely because Millikan used an inaccurate value for the viscosity of the air. 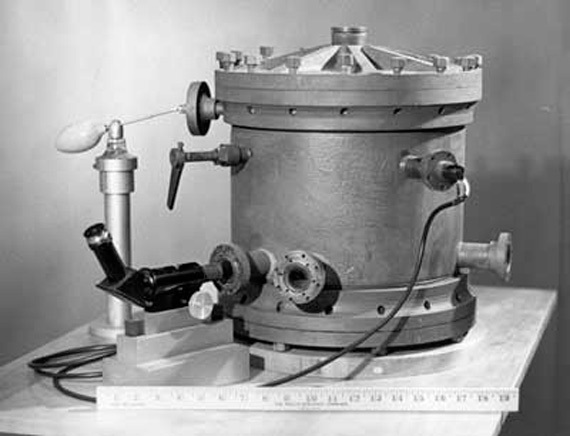 Original apparatus used by Millikan in his oil-drop experiment. Credits: Wikipedia. “Einstein’s photoelectric equation has been subject to very searching tests and it appears in every case to predict exactly the observed results”. “I spent ten years of my life testing that 1905 equation of Einstein’s [the photoelectric effect], and contrary to all my expectations I was compelled in 1915 to assert its unambiguous experimental verification in spite of its unreasonableness, since it seemed to violate everything that we knew about the interference of light”. Millikan took part in the Third Solvay Conference held in Brussels (1921) and was awarded Honorary Doctorates by twenty-five universities around the world. In addition to the Nobel Prize for Physics, he was also awarded the Comstock Prize in Physics by the National Academy of Sciences, the Edison Medal and the Hughes Medal by the Royal Society, not to mention a host of other honors. Millikan died on December 19, 1953 in San Marino, California, at the age of 85. Azcárraga, J. A., “The Legacy of Albert Einstein (1879-1955)”, OpenMind, November 20, 2015. Beléndez, A., “Einstein 1905: From ‘Energy quanta’ to ‘Light quanta’”, IYL2015-Blog, November 23, 2015. Crease, R. P., The Prism and the Pendulum. The ten most beautiful experiments in Science (Penguin, 2004). Doménech, F., “Max Planck, the Messiah of quantum physics”, OpenMind, April 23, 2016. “August, 1913: Robert Millikan Reports His Oil Drop Results”. This Month in Physics History. APS News, August/September 2006 (Volume 15, Number 8). “The making of Caltech’s first Nobel: Robert Millikan’s road to Stockholm” (The Caltech Archives). “Robert A. Millikan – Biographical”. Nobelprize.org. Nobel Media AB 2014. Web. April 12, 2017. Robert Andrews Millikan, Wikipedia (Consulted April 16, 2017). The Airship: a Truncated Past, a Promising Future?